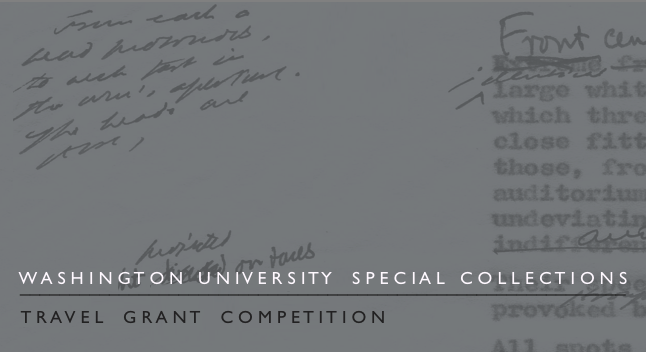 The Department of Special Collections at Washington University Libraries St. Louis, Missouri is happy to announce that this year’s travel grant competition is now open. The Application Deadline is March 15, 2014. Travel must occur between May 15, 2014 and June 30, 2015. Travel reimbursement grants of up to $1000 are available to faculty, graduate students, undergraduates, and independent scholars who would like to use our collections for research. Funds may be used for transportation, food, lodging, and photocopying. Applicants must reside at least 50 miles from St. Louis. Film and Media Archive: The Film and Media Archive is committed to the preservation of documentary film and other media which chronicle America's great political and social movements, with a particular emphasis on the African-American experience. The collections of prominent filmmakers Henry Hampton (Eyes on the Prize) and William Miles (I Remember Harlem) include hundreds of hours of high quality programming and feature a comprehensive and diverse array of primary interviews, photos, archival footage, and written documents gathered and generated during the film production process. For more information, contact Nadia Ghasedi atnghasedi@wustl.edu or (314) 935-6154, or visit our on-line catalog at http://library.wustl.edu/units/spec/filmandmedia/. Manuscripts: Collections of literary papers, press archives, and magazine archives. The bulk of the collection consists of the papers of major 20th-century literary figures including James Merrill, Samuel Beckett, Howard Nemerov, Stanley Elkin, William Gass, Mona Van Duyn, and many others. For more information, contact Joel Minor at joelminor@wustl.edu or (314) 935-5413, or visit http://library.wustl.edu/units/spec/manuscripts/. Modern Graphic History Library: Dedicated to acquiring and preserving distinguished works of modern illustration and pictorial graphic culture. Focusing on artists’ working materials and sketches as well as finished artworks, the range of the collection extends from book, magazine, and advertising illustration to graphic novels, comics, poster design, pictorial information design, and animation. In addition, the collection also contains the archives of fine artists like Ernest Trova that have a relationship with popular culture and mass media. For more information, contact Skye Lacerte at slacerte@wustl.edu or (314) 935-7741, or visit http://library.wustl.edu/units/spec/MGHL/. Rare Books: Collection strengths include the history of books and printing, especially the English Arts & Crafts movement; the book arts; semeiology and the history of non-verbal communication; a collection of Little Black Sambo books and related objects; and 19th- and 20th-century British and American literature complementing the modern literary archives housed in the manuscript unit. For more information, contact Joel Minor at joelminor@wustl.edu or (314) 935-5413, or visit http://library.wustl.edu/units/spec/rarebooks/. University Archives: The Washington University Archives is comprised of more than 300 unique collections. Most collections chronicle the history of Washington University from 1853 to the present day. These diverse collections range from the writings of University co-founder William G. Eliot, to student produced publications, and professional and personal papers of faculty members such as Arthur Holly Compton. Other collections relate to 20th-century St. Louis history, with a focus on business, transportation, politics, social welfare, urban planning, and architecture. For more information, contact Sonya Rooney at srooney@wustl.edu or (314) 935-9730, or visit http://library.wustl.edu/units/spec/archives/. 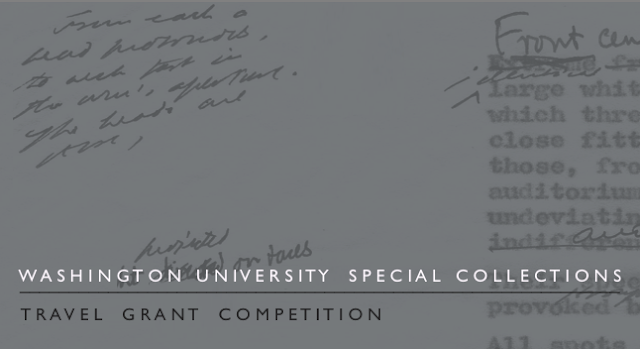 An application form is available at http://library.wustl.edu/units/spec/tg/TravelGrantApplicationForm2014.pdf.